I am no fan of scary, ghostly Halloween costumes. 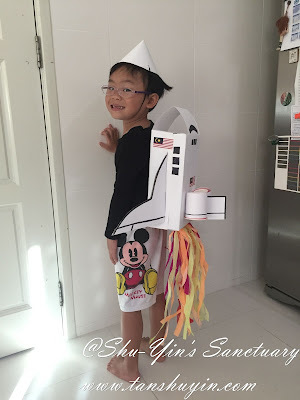 However, I enjoy the cutesy and fun costumes that the kids donned on for Halloween. 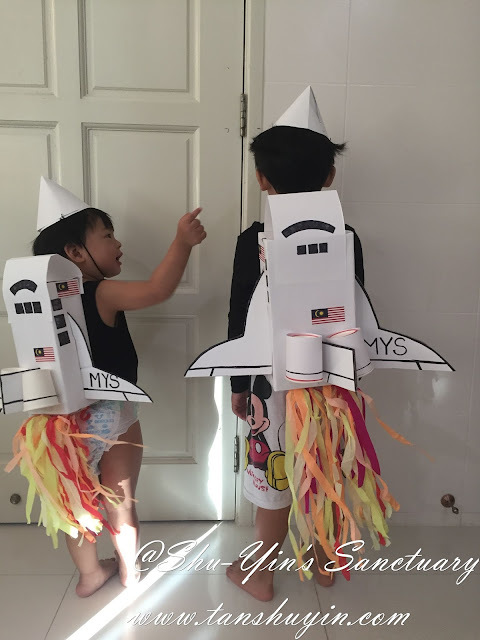 So every year, I try my best to dress my kids up in some fun costume. I initially wanted to just let them use back last year's Dragon Cape & Mask Costume for this year's Halloween as I am rather busy for the month of Oct & Nov. 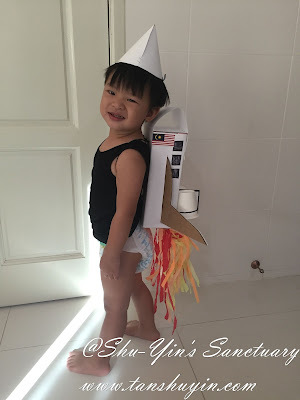 But then Khye came home and requested for a Space Shuttle costume, which he says he wants to wear it to his Mandarin class next week. 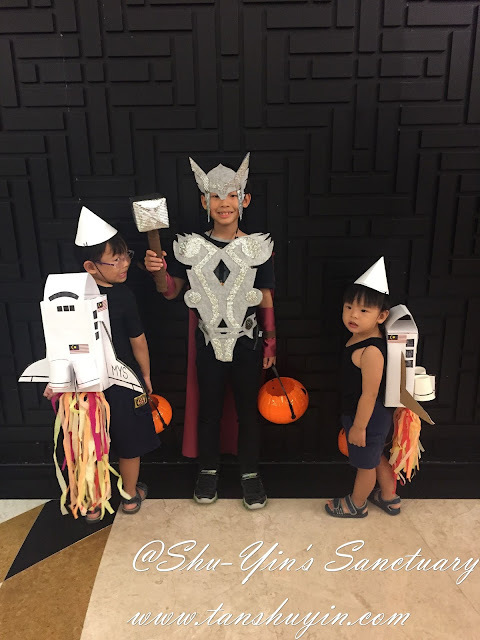 Shern also did request for a Thor costume but I told him no promise. I will see what I can do in 2 nights. 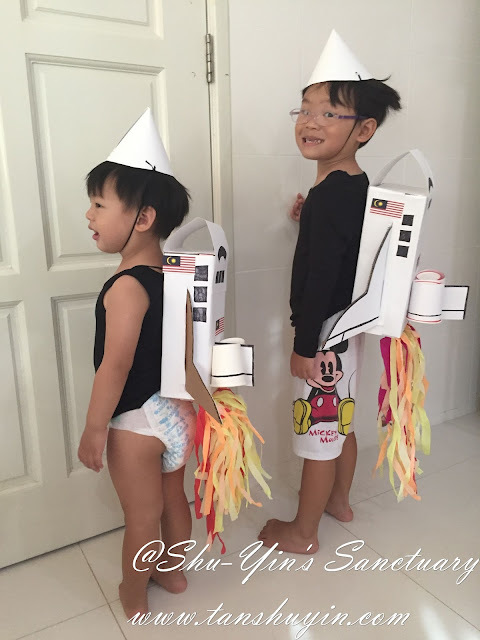 This post is about how I DIY the Space Shuttle Costumes for Khye and Vern with whatever materials I have at home. This is a very easy DIY. Took me about 2 hours to finish it. 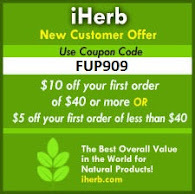 The photo below shows you how I did it. 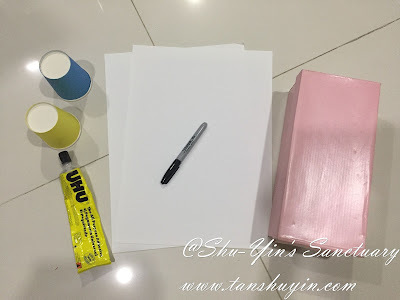 Wrap the shoe box with the white paper (easier if you can get a white shoe box). 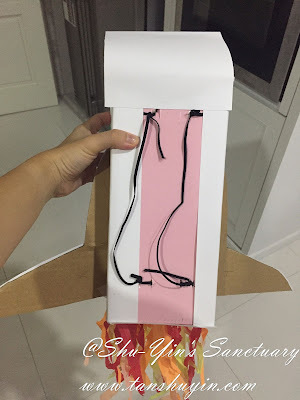 Then stick a paper on top the shoe box like a flap. Next, add some wings at the side. Stick the paper cups in front for the engines. And add a paper in between for the tail. 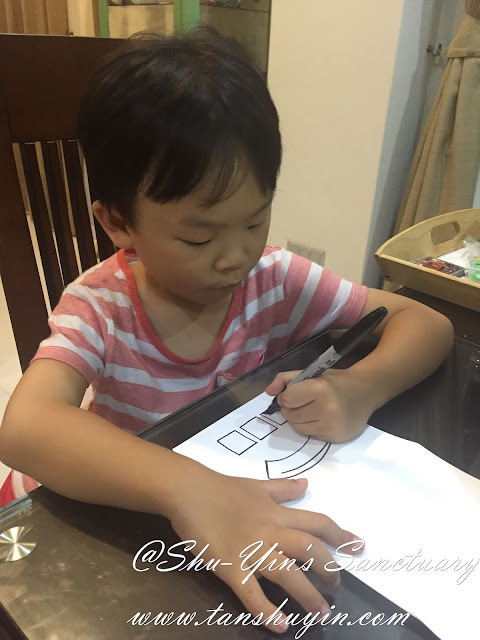 As for the pointed top, cut a circle and fold it like a hat for the kid to wear. Then draw some windows wherever you deem appropriate. 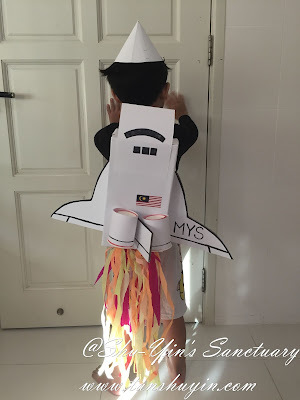 I also wrote the letters MYS for Malaysia and printed some Malaysia flag to stick onto it. Then, turn to the back and punched some holes and then thread some elastic bands into it for the kid to wear the costume. 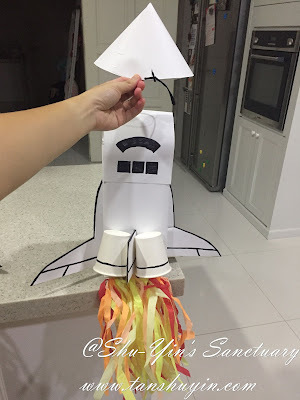 Lastly, glue some crepe paper as the fire below the space shuttle. I also involved Khye in the process. 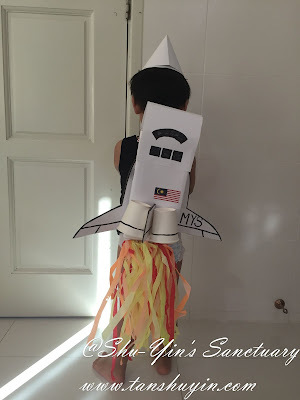 He helped me draw and colour the windows on his Space Shuttle. 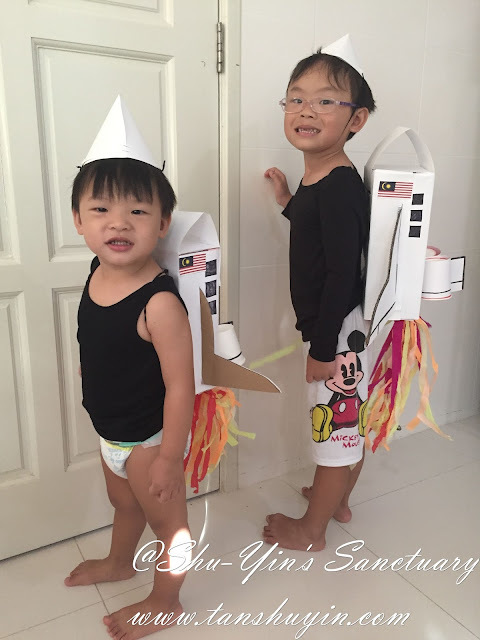 These are my 2 little models and proud owners of the Space Shuttle Costumes. More of my little models. Pardon their Mickey Mouse pants and diapers. Haha. For best effect, wear black or dark colour clothes. Love to see how happy they are while posing with their costumes at home. And just tonight was our very first Halloween event at Straits Quay. 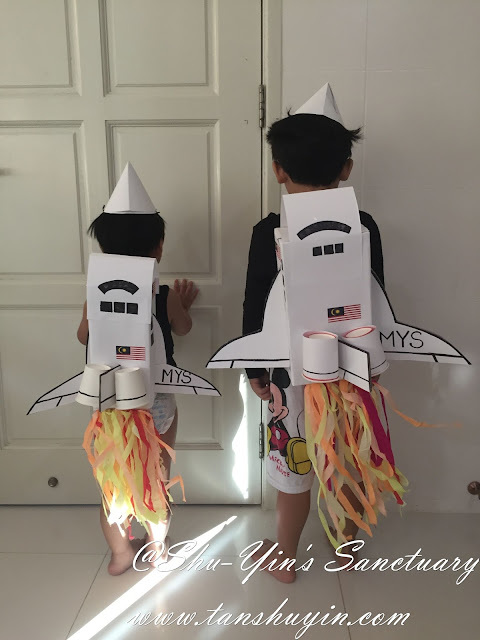 And so we brought the boys there and they were so proud to wear their costumes and to collect a big bunch of candies each. So Halloween is not until tomorrow, and many places are still celebrating it the next week. So put on your gears and put together a Halloween costume for the fun of it!